I just recently art directed photography for a new line a jewelry for Amy Conway, with photographer Greg Neumaier. I’m not big on jewelry personally, but Amy’s work definitely appeals to me. I believe she has potential to be the next John Hardy or David Yurman. This is from one of her new collections called Magic Happens, and this piece is called the Daisy Ring. 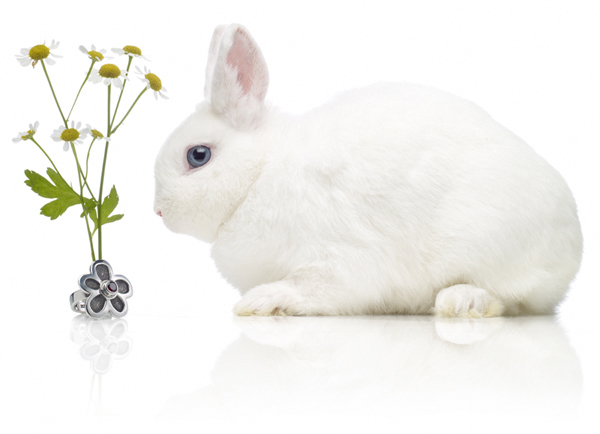 Conceptually, the idea of using a bunny to represent a magic, and that rabbits like to eat daisies and other flowers piqued my creative interest. When I found out that we could get a dwarf bunny, I was even more excited about the idea. The rabbit, named Snickers, was the best model I’ve ever shot, humans included. Once Snickers was on the set, it was all work, he just sat there as long as it took to get the shot. You could almost move him around like a piece of clay. Usually the flash unsettles animals when on set, but Snickers was not even phased by the strobe lights and all the attention of us humans.